Short-term teaching placements, particularly in less-developed parts of the world, can be a wonderful way for Canadian teachers to enrich the learning experience of students and to transfer skills to other teachers in the host country. But these placements can also be of tremendous benefit to the teachers who take time for a placement program. There are several possible career benefits to overseas placements. 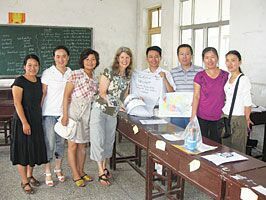 Victoria Plaskett with her students in rural China where she taught English to teachers. Canada is increasingly a multicultural country, and this is not just noticeable in our country’s big cities. Even in smaller communities, teachers must learn to work with parents and students from different cultures. This includes developing abilities to work with students with only a limited grasp of English, with learning styles that are different from those of their classmates. Teaching overseas, in a classroom full of students from another language and culture, can be an intense, challenging and rewarding way to rapidly build effectiveness in multicultural situations. While teachers in Canada may wish they had more resources, particularly in these difficult economic times when many budgets have been reduced, the truth is we’re blessed with a wide range of teaching tools. This includes textbooks, workbooks, networked computers, whiteboards, laptops, e-readers, AV equipment and many other aids. That wealth of resources stands in stark contrast to conditions in less wealthy parts of the world. For example, in many Chinese classrooms and in classrooms in many developing countries, the students aren’t even provided with chairs—they sit on the floor, stools or benches. Teaching in these environments does have its advantages; it may help a teacher re-connect with good teaching practice, without being so reliant on tools. 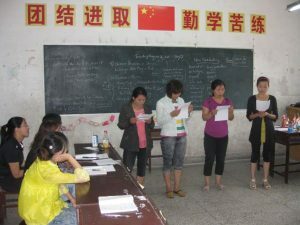 The large classroom sizes in China (60 is common) also build a teacher’s skills in engaging large groups, which may be important if budget constraints in Canada continue to push classroom sizes upwards. 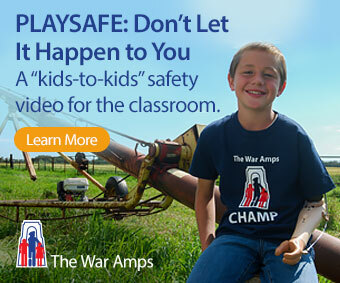 Today’s elementary and high school students already live in a world that is more globally aware than ever before. Many use Skype and Facebook to connect with people in other parts of the world, which may include their countries of origin. They will need this international perspective if they, and Canada, are to compete on a global stage. International placements give teachers a wider perspective, which they can pass on to their students when they return to teach in Canada. Having a greater awareness of how learning happens in other countries can also aid a teacher in working with parents and students from other cultures. For example, in China much of the learning is done by rote, using memorization. Students have traditionally not been encouraged to think critically. International placements can help Canadian teachers understand where their newcomer students are “coming from” both in a geographic sense and pedagogically, so they can better work with these students. An international perspective comes not just from meeting students, teachers and parents in the host country. The placement may also be a chance to meet other volunteer teachers from around the world, and share their methodologies for teaching in a culture that is foreign to them as well. In a successful international placement, attitude is everything. A positive attitude will not only impact the students in the classroom but also go a long way in smoothing tensions that inevitably arise among the teaching group and hosts. Teachers should be aware of the image they are portraying of their country, province, city and school during lunch breaks, dinners and sight-seeing. A good conversational guideline is to talk less, ask questions and listen more. Victoria and the cast member of a Kung Fu play at the Red Lantern Theatre. 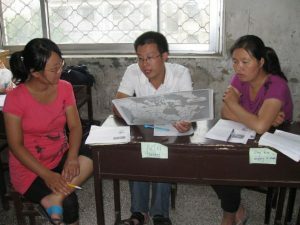 In setting up a volunteer placement, one of the most important first steps is to choose an organization that is affiliated with a group that is trustworthy, such as local non-government organizations (NGOs) working with the micro-communities, or the educational faculty of a college or university. Ensure that the group handling the on-the-ground logistics has local knowledge and capability. This includes current knowledge of any risks—any civil unrest, disease and natural hazards such as hurricanes. The program operator should have local staff members who meet teachers at the airport, organize cultural orientation, in country services (such as linking with the host agencies, accommodations and security briefing) and are always available to deal with issues as they arise. 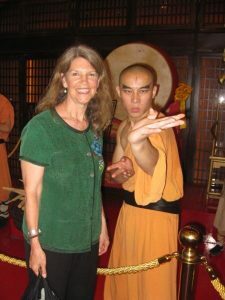 Teaching or being otherwise active in another country is a far different and often better way to learn about the culture than merely being a tourist. Having said that, it is important to take time to travel during the engagement, and afterwards when the teacher has learned more about the culture and geography and can appreciate what is available. An overseas placement can be a highlight of a teaching career, providing a renewed enthusiasm for the profession and for what it does for the rest of society. Cooperative learning strategies work everywhere, so be prepared to give those skills a workout: community circle, role playing, skits, repetition and drill. To communicate with students whose first language is not the same as yours, learn to be clear and concise, to use illustrations, and to be encouraging. Be prepared to buy some resources with your own money—many placements are with schools that are not as well supplied as are Canadian schools. Learn ahead of time about the culture to which you are going, so you don’t inadvertently cause offense. This includes issues such as gift-giving. If appropriate, take along some small gifts such as pens, mugs, t-shirts and notepads as souvenirs from your school, city, province or country. Bring along some maps, pictures, postcards and other printed material about Canada or have them shipped ahead of time so you don’t have to take them in your luggage. Learn to cope with the weather. Reusable adhesive gum such as Sticky Tack may be the only way to make paper stick to walls in high humidity. When the temperature is high and the air conditioning breaks down, hold class in the courtyard. Be prepared for the realities of post-trip reverse culture shock—when you get home you may be surprised to look at reality with new awareness after your experience overseas. Victoria Plaskett, Ed.D., is an English teacher in the Special Education Department of Durham District School Board in Ontario. 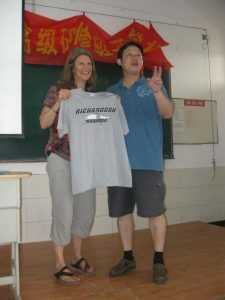 She taught English to teachers in Jiangsu Province, China with JESSIE and the University of Toronto in July, 2011. Wilson Mondal, Executive Director of Toronto-based Global Perception (www.globalperception.ca) uses his international development background to arrange volunteer placements in developing nations.